In support of its growing business, The Good Egg Fellas recently welcomed a new team member on board. 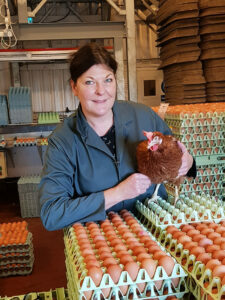 Gill Stephenson joined the company at the beginning of October 2018 to assist with egg collection, packing and distribution. With a background in admin, this role is her first venture into the world of farming and free range egg production, but she brings with her many transferable qualities, including a keen attention to detail and organisational skills. Phil Twizell, owner of The Good Egg Fellas said: “We are passionate about caring for our hens and take great pride in producing high grade, high quality eggs. As the business continues to grow having the right team in place is fundamental to ensuring that we maintain the high standards in quality and customer service that The Good Egg Fellas is renowned for. The Good Egg Fellas supplies the commercial and wholesale market and has customers all over the UK who are passionate about using good quality, fresh, free range eggs that come direct from a farm that operates to high welfare standards.